Project Description: The Bldg. 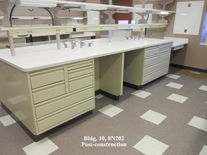 10, 8N202-8N228 Renovation Project was a very critical project to the National Heart Lung & Blood Institute. This space was renovated for several key Principal Investigators and their associated research staff. The project consisted of complete demolition of existing office suites & laboratories located in the north corridor of the Clinical Complex Center. New office suites and large laboratory suites were constructed in accordance with the specific research requirements set forth by each Principle Investigator. An existing cold room located within the projects footprint was cleaned and upgraded with new flooring, custom Trespa casework, new countertops & shelving. 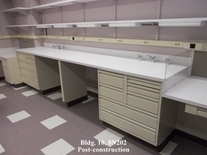 Existing equipment & microscope rooms were upgraded with new mechanical & electrical services and a new conference room with custom millwork was constructed for the Principal Investigators. Dust and infection control practices were heavily implemented during this project in order to ensure compliance with both the Joint Commission on the Accreditation of Healthcare Organizations (JCAHO) & NIH Interim Life Safety Measure (ILSM) rules and regulations. The project successfully passed all JCAHO & ILSM inspections and was turned over to the end user on time! Project Description: After the successful completion of the Bldg. 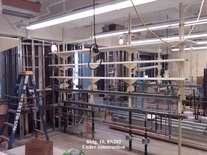 50, 3309-3311 NHLBI Laboratory Renovation Project, we were contracted by the same Institute to perform a similar design build tenure track renovation project. This project involved converting existing laboratory space into a usable tissue culture room and a microscopy room for critical research being performed on enzymes found in the brains of fruit flies. As with the 3309-3311 project, extensive temporary dust partitions were constructed of steel studs and fire retardant plastic in order to isolate construction activities from an active & occupied research environment. All construction activities occurred while adjacent laboratories were fully occupied and conducting sensitive research. This particular project was also placed on the Office of Research Facilities Management Teams high priority list as construction was being performed directly beside active labs. As with the Bldg. 50, 3309-3311 project the construction team ran into similar issues with attempting to match the proprietary building materials that are no longer produced. A private office was constructed for theprincipal investigator utilizing custom storefront framing material and window glazing. The installation of this system was particularly challenging due to the fact that existing, non-structural, arched acoustical ceiling panels were present in this area and needed to be incorporated in the design in order to achieve an aesthetically pleasing transition from the open concept work spaces with high ceilings to a single office environment, totally closed off to surrounding environments. 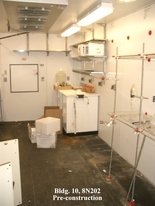 The microscopy room and tissue culture room were constructed to specific temperature control parameters (i.e. 22C) which required specialty HVAC controls and components to communicate directly with the building automation system. There were also several unique interior finish applications present on this project such as specialty CO2 regulators, blackout curtains, black ceiling tile and wall colors, etc. Mid-way through construction, the researcher informed us that several specialty, highly sensitive microscopes arriving earlier than expected from abroad and needed to be setup and calibrated. We were able to expedite construction schedule on the microscopy lab in order to accommodate the delivery and setup of these microscopes. The project was successfully completed ahead of schedule and within budget! 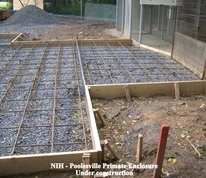 Project Description: This was a unique project performed for the researchers of the NIH Clinical Complex Center. The project involved converting an existing rooftop terrace into a usable basketball & volleyball court. The existing rooftop terrace was covered with elevated architectural pavers. All architectural pavers in an approximate 3000 square foot area were removed and re-leveled. Additional pedestal supports were added to the underside of each architectural paver in order to increase the pavers structural integrity. This was performed due to concerns surrounding the increased stress placed on the pavers due to increased use/demands of a playing surface. The pavers were covered with a Sports Court Power Game athletic surfacing material. Custom game lines were painted on the court surface for both basketball & volleyball play. Custom fencing and railing systems were designed, fabricated and installed in order to protect four critical existing facility structures: a glass enclosed utility chase; one mechanical redundancy loop enclosure, and two large mechanical exhaust louvers. This project also required the need for a new lighting design which consisted of five new wall pack lighting fixtures and the relocation of several existing pole lights. Smith & Son, Inc. supplied & installed all basketball & volleyball equipment for this project. The construction team also designed, fabricated & installed custom protective padding and sound soak acoustical treaments for a set of exterior doors near the new court location. 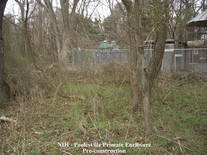 Project Description: Site preparation for new research primate enclosure which involved land clearing, preparation of concrete slab (grading and forming), installation and finishing of concrete slab, erection of Government supplied primate enclosure, installation of perimeter chain link fencing, and site stabilization and reseeding. 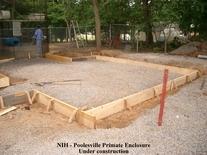 All work was performed at the NIH Animal Center located in Poolesville, Maryland. All work was completed in the immediate proximity of free ranging research primates. Project Description: This project involved extensive modification to well used scientific laboratory. The lab had sustained water damage in the past, therefore it required the removal and replacement of gypsum board wall finishes. 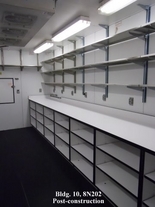 Existing metal casework was cleaned and modified to suit the researchers program requirements and sections of new casework and work top surfaces were installed as part of this project. We worked extensively with a consultant from the National Heart Lung & Blood Institute to design a custom sink application comprised of custom phenolic resin storage cabinets, white accent work top surfaces and black acrylic demising shields behind each sink station. 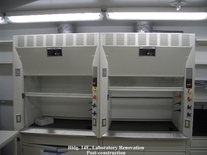 We repaired an existing 4’ fume hood in order to make it operational and installed new de-ionized water piping throughout the lab as requested by the researchers and his staff. This project was a success as it was completed on time and within budget! The custom sink stations turned out fantastic and it presented the desired sharp, contrasting aesthetic qualities within the finished lab space. Project Description: Project included demolition of an existing laboratory and electron microscope room. 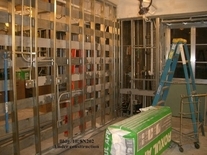 Temporary dust partitions constructed of steel studs and fire retardant plastic were erected in order to minimize dust migration and to protect the adjoining research environment. All construction activities occurred while adjacent laboratories were occupied and conducting sensitive research for the National Institute of Health, National Heart Lung & Blood Institute. 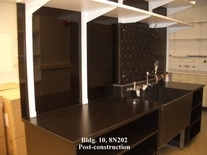 Performing construction activities near an active laboratory environment elevated construction risk parameters and placed the project on the “high priority list” for NIH’s Office of Research Facilities. Since the NIH Bldg. 50 was constructed in the late 1990’s utilizing proprietary building materials, many of the specialties building products are unavailable for use. Therefore, in order to preserve the unique aesthetic characteristics of the Bldg. 50, 3rd floor laboratory environment extreme care needed to be taken to carefully demolish the existing finishes for reuse. New work included complete construction of a two bay laboratory and 100,000-class cleanroom. 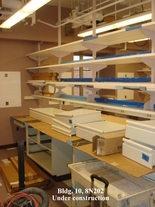 The new laboratory section was equipped with new VWR scientific grade casework and Trespa countertops/shelving. The class 100,000 cleanroom was unique in that it utilized a specialty gasketed Gordon ceiling system in order to prevent dust contamination. The cleanroom was designed to function at an ISO 8 level, however final testing revealed that the new cleanroom actually functioned at an ISO 6 thus far surpassing the design specification! The project was successfully completed on time and within budget. This was a major accomplishment due to the fact that the project was a tenure track renovation project and of critical importance for the National Heart Lung & Blood Institute (NHLBI) and the National Institutes of Health Office of Research Facilities (ORF). 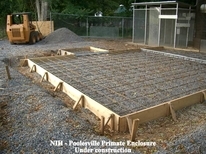 Description of Requirement: NIH – Poolesville Campus – Complete Construction of New Electrified Primate Fence Enclosure. 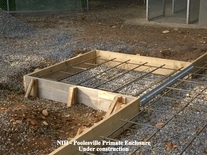 This project required the complete demolition and replacement of an electrified primate enclosure fence which was over 1 mile in length. All work was performed while the site was occupied with over 85 free ranging research monkeys. 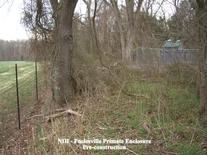 The old fencing was demolished and new fencing was replaced daily, in sections. 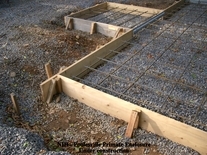 Heavy equipment (skid loaders) and man-lifts were utilized to install new pressure treated 18’ (4X4) posts and hangers. The construction team was charged with designing a new hanging system, constructed out of wood material to carry the load of the new electrified fence. Employees had to exercise extreme caution while working on this project due to the fact that they were working inside the containment area with the free ranging monkeys. This project was complicated due to the fact that some monkeys exhibited aggressive behavior. This was due to that fact that the project was taking place at the beginning of the monkeys mating season. All employees were required to wear protective surgical clothing, hair nets, masks, boot coverings, and gloves while performing all aspects of this project. Extreme care was taken to disinfect & sanitize all tools and equipment on a daily basis. Due to the sensitivity of the research subjects, photography was not permitted. Performing an extensive field survey of the existing chilled water capacity found in the building. Formulation calculations of new load requirements. Production of mechanical and electrical drawings to be reviewed and approved by NIH. 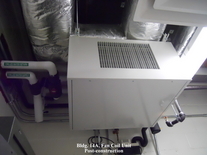 Supplying and installing two new two-ton, 120V, International fan coil units. Performing commissioning of the new units. 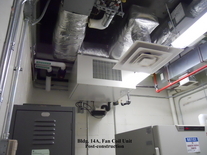 The existing building power had to be coordinated and modified in order to support the design of additional cooling in corridor F and room #127. Fire protection modifications were performed in accordance with the NIH DRM Guidelines so that the area was code compliant. This project was a success. It was completed on time and with-in budget. It reduced the excessive heat load problem previously experienced by the Bldg. 14A researchers and their staff. 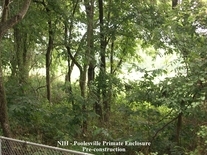 Project Description: Complete demolition and reconstruction of five free ranging primate tree houses. 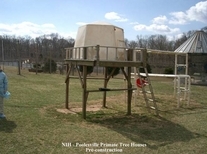 The primates utilize these structures as a means of exercise and recreation. Our team demolished the old structures, and constructed new structures with enhanced safety features (i.e. recessed bolt heads and tapered edges on posts) to help prevent injury while the monkeys are using the structures. All work was performed while the site was occupied with over 85 free ranging research monkeys. 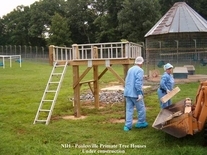 Employees had to exercise extreme caution while working on this project due to the fact that they were working inside the containment area with the free ranging monkeys. Some monkeys exhibited aggressive behaviors due to that fact that the project was taking place during their mating season. All employees were required to wear protective surgical clothing, hair nets, masks, boot coverings, and gloves while performing all aspects of this project. Tools and equipment were required to be sanitized daily before and after use. Description of Requirement: Project included demolition of systems wall partitions, doors & frames, flooring, acoustical ceiling systems, darkroom, etcetera. New work included complete construction of new optical trap room, temporary storage facility in Bldg. 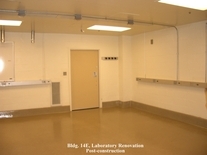 50 interstitial space, and construction of various laboratories to include items such as specialized painting (darkroom areas & splatter paint formulation), relocating and replacement of HVAC systems to achieve a high degree of air filtration, relocation and reconnecting of bio-safety cabinets and fume hoods, installation of new plumbing lines and associated fixtures, installation of laboratory grade casework, bench tops, and shelving. This particular project was extremely challenging because all work was completed while adjoining spaces were occupied and fully operational by research scientists and their staff. Therefore extreme care was taken to minimize dust & noise. This particular project was required to be completed in short order due to specific medical research commitments. The project was completed on time and to the satisfaction of high ranking recruited Doctor and to the National Heart Lung and Blood Institute. 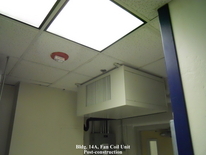 Project Description: Project involved the addition of a new 3-ton ceiling mounted fan coil unit in a freezer/equipment room which is used for storage of critical NIDDK research samples. Room was equipped with a high security biometric fingerprint reader therefore extreme care was taken while working in this active & secure environment. Project was completed on time and within budget. This was a true design build project which was value engineered by David C. Smith & Son, Inc. and NIDDK staff in order to save money. Project Description: NIH - Bldg. 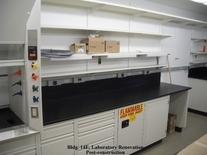 14E Laboratory Renovation, rooms E104, E107D, & E111B. Complete demolition and renovation of existing scientific laboratory spaces. New work included installing dust protection, cutting of existing concrete slab, installation of new sewer lines, replacement of concrete floor; and epoxy floor finishing, construction of new interior partitions, fire proofing, mechanical, electrical, and plumbing installation & upgrades, vapor proof lighting installation, installation of new fiberglass reinforced plastic doors and frames, procurement and installation of laboratory casework and countertops, procurement and installation of custom millwork. Specialty rooms for this project included: professional offices, scanning electron microscope room, and a microinjection room. This work took place in an active animal care/surgical facility therefore extreme care was taken to minimize dust, noise, and vibration. 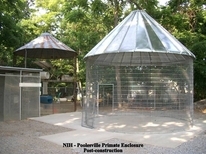 The construction crew designed and implemented a dust containment tent at project entrance and exit locations. This dust containment tent proved to be an extremely valuable tool on the construction site. It helped to capture much of the dust/dirt debris which was produced during the demolition phase of the project. The construction team received numerous positive comments from research scientist, surgeons, and facility support staff on the implementation of the dust containment structure.